As a low-glycemic, fiber-rich fruit, Taylor Brothers’ prunes are a portable, convenient, and energy-loaded snack. 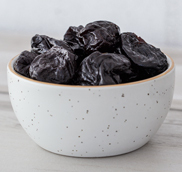 In addition to being full of potassium, antioxidants, and Vitamin A, prunes also help the body absorb calcium, which is why recent studies show that a daily serving of 5-6 prunes may help prevent and even reverse bone loss. All prunes are plums, but not all plums can be prunes! A plum that can be dried without fermenting is a prune. Taylor Brothers grow the California Dried Plum, a new and improved offshoot of La Petite D'Agen prune, which is native to Southwestern France. In 1916, Kentucky-born Earl Taylor arrived in California to farm the rich soils of Sutter County, 30 miles north of Sacramento. His son George followed in his footsteps, purchasing 90 acres from his parents and farming until 1980. Today, Earl’s grandsons, brothers Richard and John, carry on the family tradition through Taylor Brothers Farms, Inc., the world’s leading grower and processor of organic prunes. Before the Taylor brothers began farming, their father taught them the meaning of grit. In 1955, the Feather River levees gave way, flooding acres of George’s farmland and forcing the family to start over. “We had 250 head of cattle, and my dad liked horses. He was a great roper, sort of a misplaced cowboy. So, he planted alfalfa. Every summer and Christmas break, we worked on the farm. We had to ‘buck a lot of hay’ in those days, but it instilled a strong work ethic in us,” says John. 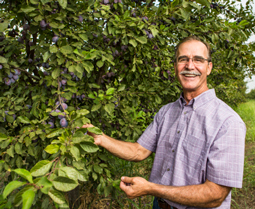 After studying Farm Management at California Polytechnic University, San Luis Obispo, Richard started farming prunes on the ranch in 1974. John also joined the family business upon graduation from California State University, Fresno, where he received his B.Sc. in Agronomy and Crop Science. “The early 80's were tough; so we diversified, re-opened a roadside stand that our family had used years before, and began working farmers’ markets most days of the week. From June 1st through Thanksgiving, we didn’t have a day off!” says John. The roadside stand soon became a great source of direct market research, leading the brothers to their present business venture. Today, Taylor Brothers Farms is the world’s largest organic prune grower and processor and a leading producer of high-quality conventional prunes and prune products. The California-based business is an international operation with facilities in Europe and Asia. Having control over the entire process made it possible for them to develop other prune products, such as powder, juice, concentrate (extract), and paste. Taylor Brothers is also a leading ingredient supplier for the domestic organic baby food market. While prunes make delicious snacks, American consumers and chefs are becoming increasingly familiar with the multiple culinary uses of California prunes. For example, without imparting a prune flavor, prune extract can be used to marinate meat or meat substitutes to tenderize, enhance flavor, and help retain moisture.